In 1826, a silk mill was erected in Beeston by William Lowe, a Nottingham hosier who had strong links with Beeston. It was built on what was then The Turnpike, on the corner of what was then Brown Lane. Now the corner of High Road and Station Road, the site is now in the centre of modern Beeston, and largely incorporated into the Tesco development, but was then on the northern edge of the village core. The mill was to be a significant employer in Beeston for over 75 years. Up until then, the well established silk mill in Derby, about 12 miles further from Nottingham, would have provided much of the local requirements for the silk knitting industry in the Nottingham area and elsewhere. This Derby mill had been founded in 1717-21 by the Lombe Brothers, based on trade secrets learned while in Italy, and had passed through several hands after it was sold by the Lombe family in 1739 until, after 1803, it was operated by the Taylor family, which continued to do so until about 1856 when George Taylor, the then owner, became bankrupt and the machinery and property lease were sold off 1. There seems no doubt that Lowe, saw commercial advantages in establishing a similar mill which was closer to Nottingham, where he and others needed the silk thread and where, in a village which was then attracting people from the nearby rural areas, he will have expected to find a pool of cheap labour. William Lowe had interesting origins. Also known as William Read, he was the son of Mary Read, one of three children born to her out of wedlock. The eldest child, Mary Read, was born in about 1785, William in 1779 at Beeston and the youngest, Elizabeth, in 1782, probably at Lenton. Both William and Elizabeth were baptised at Beeston Parish Church 2. At the time of Elizabeth's baptism, her mother did public penance by coming into church barefoot and clad in a white sheet - believed to be one of the last occasions in the country when this practice was enforced 3. The two eldest sometimes took the name Lowe, clearly from the names of William and Elizabeth's father - who, as we shall see, was William Lowe (cir 1724-1788), the eldest son of Lemuel Lowe (1689-1779) who had connections, through marriage with the Staunton and Brough families of Staunton, near Newark, Notts 4. In 1766, William married Ann, the wealthy widow of Joseph Rigby, a London merchant 5, a relationship which gave him access to Ann's substantial property and monetary wealth and enabled him to invest in property, including a house on Pilcher Gate, in Nottingham 6. Whether this marriage was just one of mutual convenience is not clear - it appears there were no children born to the marriage - but what is apparent is that Lowe's relationship with Elizabeth Read continued - and, as already indicated, two more children were born to the couple. What is also clear is that the three children stayed close throughout their lives, living in or, in the case of William, carrying on business in Beeston. What Did the Mill Produce ? - Silk mills such as those at Derby and at Beeston processed raw silk to form threads suitable for use in hosiery knitting, weaving and sewing. The raw silk thread had, of course, started as a secretion by silk worms, nurtured on mulberry leaves, forming a cocoon consisting of a long silk thread. The outer, softer covering of the cocoon - known as floss-silk - was put aside for spinning, while the inner cocoons were softened in warm water to allow the long filaments from perhaps twenty cocoons at a time to be drawn off together and gathered in hanks or skeins, for processing into finished silk thread. All of these initial processes described so far were carried out almost exclusively in the traditional silk producing countries, notably Italy, China and other countries in Asia 7. It is the onward processing to produce usable silk threads of various types and qualities - which had also been the preserve of the producer countries - which Lombe's Derby mill had encroached on early in the 18th century and it is these processes, which started with the hanks of raw silk, that the Beeston mill would also have carried out, using specialist machines. Winding - After the raw silk arrived at the mill, it would be wound onto bobbins so that further processes could be applied to it in a standard way. The process was mechanised using specialised winding machines (shown right). The original hanks would be placed around the banks of skein holders - known as 'swifts' - and the thread wound onto corresponding rotating bobbins onto which the silk filament was evenly wound by a to-and-fro movement of the guides that preceded the bobbin. Cleaning - Irregularities in the thread would be removed by passing it through a narrow gap in a metal plate. 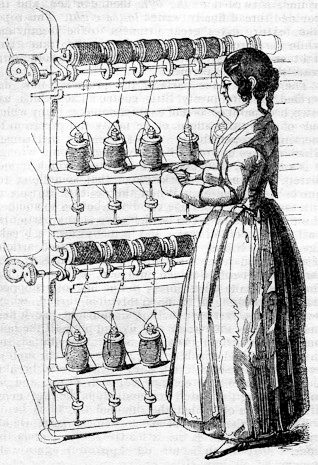 Twisting - A twist was introduced into the thread to add strength using machines (shown left) which held a number of horizontally rotating bobbins from which the thread was transferred to corresponding stationery bobbins mounted on rotating vertical shafts on which a 'flyer' provided a twist to the thread as it was transferred to the bobbin. The degree of twist was determined by varying the speed of the two moving components. The resulting single threads - 'singles' - were used in ribbon weaving and less expensive silk items or go on for further processing. Doubling - silk threads required for use in knitting or weaving as a weft ('tram'), as a warp ('organzine') or as sewing thread ('sewings') consist of three or more filaments which are combined ('doubled') to add thickness and strength. Organzine is doubled twice and sewing threads are given further doubling. In the early factories, this process was carried out on a hand-turned wheel (shown right), similar to a spinning wheel, on which the operator combined threads from the required number of bobbins on to the large wheel. At this stage the combined threads consisted of an untwisted group of individual threads. Throwing - this process takes the untwisted doubled thread and applies a twist in essentially the same way as the original twisting process. In early factories, doubled treads were arranged on a machine, similar in principle to the twisting machine. 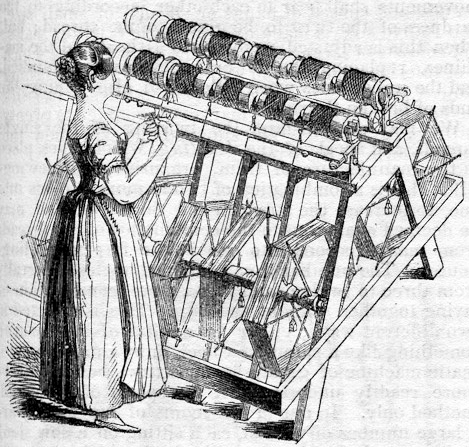 which fed that doubled thread, from horizontally rotating skein holders onto corresponding, vertically mounted bobbins, after passing through a rotating 'flyer' which provided the twist to the combined thread elements. Again, the stiffness of the finished thread was determined by the relative speeds of delivery and winding. Virtually all machines in mills like the one at Beeston, would have been arranged in groups and driven by a central steam engine which distributed its power by shafting and belting to individual machines.Although we do not know details about the original (1826) factory, we do know that the main building of the later factory, which survived as a building until recent years, was substantial. having four upper stories above its ground floor, each floor having an estimated area of 160 by 30 feet with an additional, slightly offset section fronting on what became High Road - and there were many auxiliary buildings and a reservoir on the substantial site. This true factory environment would have been relatively unusual in the early 19th century and would have been seen as a threat and feared by workers used to cottage-based working. As is well known, these changes, and other social issues of the time, caused much unrest and, as we will see, these were to touch on the Beeston mill in a devastating way. Progress - and Disaster - The mill operation was soon well established such that, by 1831 it was employing 200 hands 9. However, this was a time of civil unrest when there was widespread agitation for Parliamentary reform. Representation in Parliament, based on an ancient allocation of seats which had resulted in the infamous "Rotten Boroughs" - where tiny communities elected several members - and for some major urban areas - such as Birmingham, Manchester and Leeds - which had little or no representatives. And too, with an existing system where only an estimated 200,000 had the vote, the call was for an extension of the franchise. The first attempt to pass a Reform Bill had failed in 1830 but in the following year there were hopes in the country that a second attempt would succeed, especially after it passed the Commons in September by a relatively high margin. All now rested on the Lords - where opposition had previously been greatest. It wasn't as though the reforms were that far-reaching - apart from the much over-due abolition of the 'rotten boroughs', there was just a modest extension of the franchise to the smaller property owners and occupiers. But, even these proposals failed in the Lords. On October 8th, the Bill was defeated there by 199 votes to 158. There was an immediate and furious reaction from those who wanted change 10. 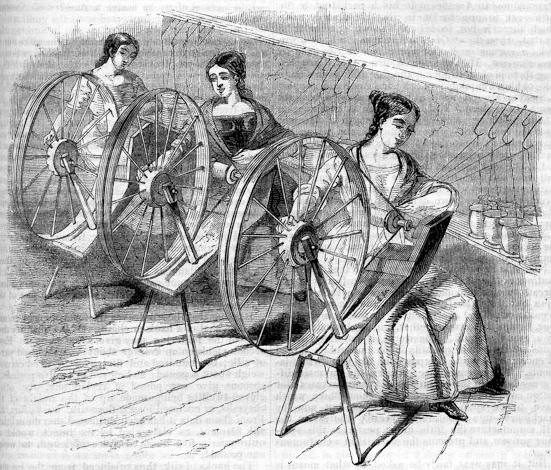 Nottingham, where elections had become chaotic affairs, had long been a centre for the fight for electoral reform and, in the 20 years leading up to the Reform Bill rejection, grievances within the depressed hosiery industry had lead to violence - in particular, the Luddites had reacted violently to changes that further threatened their ability to earn a living wage and frames had been smashed and disturbances were frequent. That was the background when the news was received in Nottingham by excited crowds which. although not expecting victory, nevertheless had hoped for good news. When their fears were confirmed, their reaction was immediate and continued for a further two days, despite the reading of the Riot Act and the intervention of a troop of the 15th Hussars 10. The next day, the mob could not be contained and descended first on Colwick Hall - the home of John Musters, well known as an arch Tory and opponent of Reform - where the contents were wrecked and plundered. Undeterred by an increased military presence in the town, the crowd moved on to attack the Castle, then home of the 4th Duke of Newcastle - an ultra-Tory and, for many, then the most despised person in Nottingham. By 9 o'clock in the evening the Castle was alight and, despite heavy rain, crowds gathered to view the spectacle. Overnight, the military presence was increased and many special constables were sworn in but the rioters, were gaining in confidence and momentum and they now advanced outside of the Town looking for more targets. After stopping to demand food and money from various known anti-reformers on the way, the mob, by now numbering 2-3000, arrived in Beeston where many of them called at the Greyhound Inn and the Durham Ox demanding ale. But their target at Beeston, it seems, was the silk mill - William Lowe being a well known Tory hosier. Witnesses later stated that the rioters, by then moving in military precision, were led by 20 year old George Beck, a boatman from Wollaton. It seems the mill was a predetermined target as Beck is said to have called out, "Halt front, this is the place; fall round and do your duty" 12. They were clear about who owned it too, setting about looking for "old Lowe" and calling, "Where is he? Where is he" We will cut him to pieces and frizzle him". Happily for Lowe, it seems he wasn't present. It wasn't long though before the mill was well alight and, together with its substantial stock and machinery was a total wreck. After the rioters left Beeston, they went on to Chilwell where they intended to attack Chilwell Hall, the home of the Charlton family 13. However, on arrival and finding that William Charlton had died and his body was laying in the house, they left, moving on to Wollaton. There, they attempted to enter the Hall park, but here they came against a well prepared defence 14, and it was here that there progress faltered - particularly as the Wollaton Yeomanry took 16 or 17 prisoners and escorted then - not without considerable difficulty - to the County gaol. During this transfer, a shot was fired and an alleged rioter was injured. With the military now clearly prepared to take a hard line, the rioters began to disperse. It was the end of the immediate episode of extreme violence, but for some of those that had been arrested it meant the ultimate penalty. And, those that had lost property - particularly the Duke of Newcastle and William Lowe - were determined to receive compensation. The trial of 23 of those had been arrested - including most of those taken at Wollaton Hall - was held at a Special Assize at Nottingham's Shire Hall which opened on 4th January 1832, covering the events at Colwick, the Castle, Beeston and Wollaton Park. Five of those arrested had been released without trial, but many of the 23 remaining, those charged with arson or rioting, faced the death penalty if found guilty. The trial against those alleged to be involved in the destruction at the Beeston mill - 12 of the 23 - took place over several days, starting on the 6th January. Eventually, George Beck - said to have been the ringleader was found guilty, along with five others - George Hearson, John Armstrong, Thomas Shelton, David Thurman and William Kitchen. Six of those accused were found Not Guilty. The remaining six were sentenced to death although, Thurman and Kitchen were among those who were recommended for the King's mercy; their sentence was reduced to transportation for life. Shelton's death sentence was also commuted to transportation, with only one day to spare before he was due to hang. Beck - who had been specifically excluded from the Judge's recommendation for mercy, despite it being recommended by the Jury and his previous good character - together with Hearson and Armstrong were hanged at around noon on February 1st 1832, on a scaffold erected outside the Shire Hall in Nottingham 15. As usual, the sad event was witnessed by a great crowd, unusually well managed by extra constables and three Army deployments to ensure order 16. The three man who had their sentences were commuted to Transportation for Life - Shelton, Thurman and Kitchen - were soon on their way to the penal colony in Tasmania - then known as Van Diemans Land - after first spending time in one of the prison ships ('hulks'). Thurman and Kitchen arrival at and departure from the hulk 'Justitia', moored at Woolwich, is shown above, in an extract from the ship's register. Shelton also spent time on the 'Justinia' before leaving for Tasmania 17. Subsequently, the Duke of Newcastle and William Lowe sought damages for their respective losses. Their claims were brought against the Broxtowe Hundred, were heard at Leicester Assizes in the following August. They were based on an Act of Parliament which established that damage done to buildings was the responsibility of the inhabitants of the Hundred in which it took place. Broxtowe Hundred extended to the west of Nottingham and included 34 parishes, including Beeston and the extra-parochial parts of Nottingham - which included Nottingham Castle. This meant that, when the court ruled in favour of the plaintiffs, the whole cost of the settlement fell, not on Nottingham itself, but on the small communities which made up the Hundred - many of which had had no involvement in the riot. The Duke's claim was for a total of about £31,000 and was awarded about £21,000 - with costs, a total of about £23,000. Lowe's compensation was in the order of £12,000 plus his legal costs - a total sum that included £6.650 for the building, engine and machinery - which was said to be made largely of brass and mahogany rather than the more usual iron and more common wood - and amount of £1,140 to cover a large quantity of silk that was lost in the blaze 18. Taken together, the two awards totaled in the order of £35,000 - a huge sum, and all to be borne by Broxtowe Hundred - of which Beeston was a part. As it's share of the compensation, Beeston was required to pay £856 - a crippling blow to the economy of Beeston, particularly as it had also lost the 200 jobs that the mill had provided 19. However, Lowe set about rebuilding the mill and it was soon up and running - and providing Beeston with jobs. But, by then it was not as significant to the Beeston economy as is often thought. As we will see, claims by the owners as to the numbers employed, overstate the actual numbers greatly, at least as far as those who were actually Beeston residents. The census of June 1841, taken about two months after the death of William Lowe and about 8 or 9 years after the mill was rebuilt, gives us the first chance to assess its contribution to local employment 20. At its peak, from 1851 to 1871, the mill was a particularly significant local employer of female labour, reaching a high of nearly 37%. The mills contribution to male employment was much less significant, reaching a high of only 12%, mainly boys, in 1851. The numbers employed reached a peak in the decade up to 1851 after Francis Butcher Gill had taken over in 1841. There was a corresponding dramatic drop in the average age of employees, falling to a low of just over 18 years for both males and females in 1851. This was far below the overall for the total working population in the village (33.5 years for males, 28.3 for females). Average ages rose after 1851, as the number of child workers dropped, probably as outside options for education developed. Francis Butcher Gill Takes Over - William Lowe died at Beeston on 28 March 1841, aged 61, having made his will just over two weeks earlier, and leaving a substantial estate approaching £18,000 21. His wife Sarah had died in November 1837 22. and the couple were apparently childless, so it is not surprising that, in his will he had made financial provision for his sister Elizabeth Read, still unmarried and who had apparently kept house for him at Pilcher Gate, 23 for his sister Mary Barker's large family 24, a number of apparent friends, some Nottingham good causes, his surgeon and his servants 25. For Elizabeth Read, there was 50 guineas a year for life and an annuity of £150 a year. For two of Elizabeth Barker's married daughter's there was to be an income of 25 guineas a year for life, debts owing by her sons were forgiven 26 and each of the nine children then living were left an equal share of the residue of the estate. Lowe's main bequest was of the silk mill itself. Perhaps remarkably, he left the mill, subject to the payment of the various annuities which are detailed above, to Francis Butcher Gill. Gill and John Watson were appointed executors of the estate. Although the reasons for this bequest are not entirely clear, it has to be seen in the context of his personal circumstances. Having no family of his own and having provided for his sister, nephews, nieces, friends, servants and good causes, it seems that his intention was to ensure a future for the mill and therefor for its employees. It seems he must have decided that Francis Butcher Gill, a Nottingham silk and cotton commission agent with whom he would have been well acquainted and was probably someone he had worked with closely, was someone with whom the mill's future was most secure. Although he had already served as Sheriff of Nottingham in 1838/39, Gill was then a relatively young man, aged about 32 at the time he took over. He was born in Nottingham in about 1808, the younger son of George and Sarah (née Butcher) Gill. George Gill had made a fortune, first as a hosier and latterly as a commission agent in partnership with Francis. He was also an active philanthropist for most of his adult life, involving himself both actively and financially in assisting and encouraging working people in Nottingham. In 1846, with others, he was a founder of People's College with a direct financial contribution of £3000. Then, in 1852, he financed The Working Man's Retreat on Plantagenet Street (off St Annes Well Road), a home for aged working men and, in 1853, he financed, with £4000, the 'People's Hall' on Beck Lane (Heathcote Street). where working people could meet, complete with a library, class rooms and a lecture hall. He also donated £1000 towards a ward and chapel at the General Hospital 27. Francis Gill appears to have stamped his mark on the silk mill at Beeston soon after taking over. He soon moved from The Park in Nottingham where he had lived with his parents to Beeston where, at first, he stayed in the household of Henry Kirkland, the lace manufacturer, on Market Street (now Middle Street), close to the silk mill 28 and, it seems, set about making some changes in the size and composition of the workforce. Over the next ten years, the number of Beeston residents who were employed at the mill rose dramatically, reaching 382 - some 22% of the working population. In particular, he appears to have taken steps to attract younger workers by introducing part-time schooling at the mill. As a result, for the first time, children under 11 were employed - reaching a probable peak of 44 (over 11% of the total mill's total workforce by 1851 (see table above). The Factory Act of 1833 had restricted the number of working hours per day for children under 12 to a maximum of 9 and a maximum of 48 hours per week and they were to be given two hours schooling each week. The Factory Act of 1844 extended the schooling requirement substantially, to half of each day at school. Gill therefor provided a schoolroom at the mill where the children were taught on alternate days, the other being a full day working in the mill. Gill will have seen this arrangement as of benefit to both parties, as it seems to have provided a supply of young - that is, low paid - labour while providing the children with a basic education they might not have received otherwise. In the context of the age, it served a purpose. It is significant that the "Ten Bell", which is now a feature outside the Sainsburys store on Stoney Street, Beeston and once called workers and pupils to the mill ten minutes before starting time, dates from this time. It was cast by John Taylor, the Loughborough bell founder and is dates 1841. Clearly, Gill sought a well-disciplined workforce 29. Early teaching standards at the mill may well have been unremarkable, but this is known to have improved when, by 1861, a Miss Leah Cowell was appointed to run the school. She was a well regarded and respected lady who served the community well and who continued to teach at the mill school, probably until 1883, when the first local Board School opened 30. In 1849, Francis Gill married Martha Donston Huthwaite 31 and, by 1851, they had settled into Bonds House, to the west of the church on Chilwell Road, Beeston - the building later known as The Grange and now occupied as the Area Police Headquarters - living in some style with three servants, sharing the house with Edward Bond, a Beeston farmer, then a widower 32. John Watson Joins the Firm - By that time, Gill had been joined by John Watson 33 - who had been the co-executor of William Lowe's will - as a partner in the firm F B Gill & Co, owners of the silk mill. Watson, born in 1791, had been a clerk and later a manager with the banking firm of I(cabod) & I. C. Wright & Co 34. He had married Sarah Stretton in 1826 and had five children before his wife's early death in 1837. 35. Now, by 1851, he moved to Beeston and involved himself, in partnership with Gill, in the silk business - although, in 1851, he did this alongside his position as a manager with Wright's bank and as an agent to the Guardian Fire & Life Assurance Company 36. At the same time Gill and Watson collaborated in substantial investments in property - including a major purchase of land on what became Wollaton Road 37. By this time he had moved to Beeston where he and, from time to time, various members of his family lived at The Villa, set in its own grounds on the north side of what is now the High Road, taking in the corner of Wollaton Road (where the NatWest Bank now stands) and extending north to the smithy (now a funeral directors). This house will be remembered by older Beeston residents as the home of the Conservative Club (shown below in its last days in 1962) before redevelopment in the early 1960s, and is now the site of Boots the Chemist. In May 1857, Gill had opened in a neigbouring community too, having acquired property between what is now Cemetery Road and Mount Street, fronting onto the Main Road at Stapleford, Notts. In January 1868, 50% ownership of this property was transferred to his partner, John Watson. It seems that these premises continued to operate as a branch of the Beeston mill for about 30 years until the property was disposed of, as we shall see, in the last years of the Beeston mill 38. Meanwhile, Gill and his wife, together with a niece, had moved to live, notwithstanding a 'quiet and retiring disposition' 39 , in some style - they employed six servants - in Nottingham's fashionable Park Estate 40. By 1871 he had retired and moved to Walcot, near Bath in Somerset 41 where he occupied himself as a Justice of the Peace and, like his father before him, with philanthropic works. In 1870 he founded a charity with nearly £85,000 which he vested in twelve trustees, the income to be devoted to pensions of £20 each per annum to unmarried widows and fatherless unmarried daughters of clergymen or of professional persons or others who had occupied a like position 42. He died in April 1884, leaving over £34,000, followed by his wife in the following year 43. John Watson, continued to live at his Beeston home for the rest of his life, taking over the sole ownership and operation of the mill, with the assistance of his eldest son Samuel Watson. He was a major benefactor to the Parish Church in Beeston. As well as a substantial memorial to him which survives in the churchyard, the west window of the church was placed there by the family, as a further memorial to him 44. In 1877, the parishioners added two treble bells to complete the peal at the church, in recognition of his substantial contribution during his lifetime. Following his death in November 1876 45, his son Samuel took over the house and mill. Other children of John & Sarah Watson where:. John Watson (1830-1889), became a solicitor in Nottingham after Articles as a solicitor's clerk in London. He served as the first Registrar of Southwell, Nottinghamshire. He married Elizabeth Anne Braithwaite (1835-1911) in 1855 and they made their home in Nottingham's Park Estate; there were no children of the marriage. At his death he left nearly £40,000 46. George Streeton Watson (c1832-1865) followed an Army career and never married. He was serving as a Captain in Cawmpore, East Indies, with the 88th Regiment of Infantry when he died at sea, presumably on route to or from his posting. 47. Sarah Watson (c1833-1890) did not marry. She was an active worker and visitor for the Parish Church and was said to be kind and generous. Fittingly, there is a memorial window to her in the Parish Church which depicts the charity of Dorcas. 48. Emily Watson (c1836-1906, married George William Peake in 1860 and had one son, Towards the end of her life she moved to Guernsey where her son established a fruit farm, She died on the island in 1906. 49. The Samuel Watson Era - John Watson's oldest son, Samuel Watson, was born in Nottingham around 1828 50. He never married and lived with his father, and then alone, at the family's Beeston home for most of his adult life. By 1851, aged only 23, he was already the Superintendent Manager at the silk mill 51. After his father's death in 1876, he took over sole ownership and continued at the family home surrounded, for most of the time, with up to five domestic servants. Although he appears to have devoted much of his energies to the mill, it appears that he also developed friendships and local connections, as it is known that he owned a pack of hounds and hunted regularly and a Masonic Hall was erected on the mill site. 52. 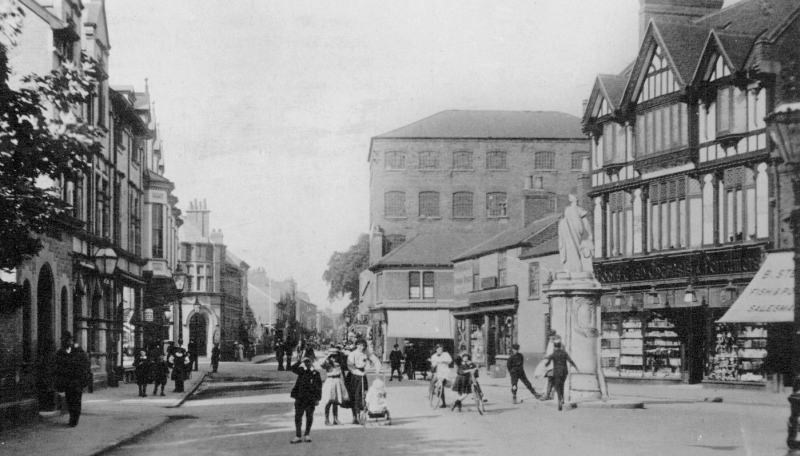 The house and mill, being either side of what had been the Nottingham to Sawley turnpike had, at the time that Samuel took over from his father, only relatively recently begun to develop as Beeston's main street. It the early development of the village, the Turnpike marked the northern limit of the old village core with what is now Middle Street - then Market Street - in its centre and Nether Street marking the lower limit of the village core, the whole being surrounded by the open fields. By 1861 the Turnpike had become High Road and was just beginning to evolve into a shopping street. The silk mill and the Watson home found itself in the centre of this potential. The plan shown below left 53 shows the commanding position of the existing family home (coloured yellow) which stood in substantial, formal grounds extending from Wollaton Road to Villa Street and as far north as the Smithy and opposite the extensive mill site (coloured grey and grey-green) on the south side of the High Road and the east side of Brown Lane (now Station Road). During the ten years after taking over, Samuel Watson appears to have prospered, such that he was able to acquire several properties surrounding the mill, apparently as an investment and possible with a view to developing the High Road frontage to take advantage of the developing retail use of High Road. His first acquisition, in December 1876 54, was Mill Yard (coloured red) which adjoined the mill site to the east and include a number of cottages, probably six, three on each side of the entrance to the yard. These pre-dated 1841 when five of the cottages were occupied and they continued to provide accommodation at the lower-end, and saw many changes of tenants, throughout the remainder of the 19th and into the 20th century. At the entrance to the yard, there was also a sales-shop, with accommodation above the shop; this became 30 High Road and survived until comparatively modern times 55. In April 1883 56, he acquired 2349 square yards of land (coloured purple) to the east of Mill Yard, with frontage in High Road up to the corner of Acacia Walk. As the north-western end of Narrow Lane Croft, it extended down Acacia Walk as far as land then owned by William Roberts. Three dwellings stood at the High Road end, with shops attached to two of them (then 14 & 16 High Road, later to become numbers 36 & 38).a bakery and other associated buildings. In December 1886 57, he purchased 11 cottages on 982 sq yards of land in Villa Street (coloured brown), immediately to the north of his home. 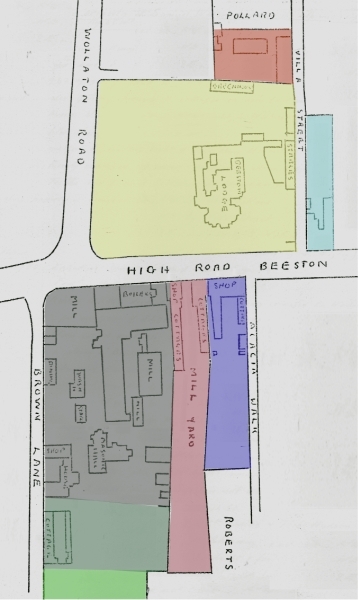 At around this time too, he bought 7 & 9 High Road, a pair of shops with living accommodation on 780 square yards of land (coloured blue), on the east corner of High Road and Villa Street. 58. Now that all the property had been acquired in the area, it was ripe for redevelopment; the detailed story of its subsequent evolution to a shopping street and details of all those who traded may be found in our story of the High Road. In 1891 he provided the land for Brown Lane Sunday School, built by Beeston Parish Church on land adjoining the mill property to the south, purchased by Watson from Horatio Henry Udall, and also donated the cost of the adjoining caretaker's house 59. This was, as it turned out, a final act of benevolence - one of many - to the local church that had been made by the Watson family. The reality was that, by 1892, Watson had begun to run into financial difficulties. It was in that year that he began to borrow at what became an increasingly desperate rate, against a series of mortgages secured against the Beeston properties. That first loan by Nottingham solicitor Frederick Wadsworth and an unidentified 'J W Sidebotham' was apparently for £4,000 and apparently against the mill itself 60. This amount was still outstanding, together with interest arrears, in November 1900 when Watson looked to Wadsworth for a further advance of £1450, offering a charge on the properties acquired during the previous decade as well as the southern part of the mill site (coloured grey-green on the plan), which included five cottages fronting onto Brown Lane. Just over a year earlier, in September 1899, Watson had given a second mortgage, probably also against the mill itself, to Capital & Counties Bank Ltd as security for other substantial borrowings. The additional loan to Wadsworth, made against a substantial part of his other assets, appears to have unsettled Capital & Counties Bank, which demanded further security for its loans and a further mortgage, dated February 1901 was the result 61. The decade up to 1902, when the mill was finally closed 62, must have been a desperate time for Watson. Scrambling for funds, he sold his Stapleford mill in April 1898 for £2,550 63 and possible other more peripheral holdings that he had acquired over the years, But, with a total of five mortgages against his Beeston property and no more collateral to offer, that end was probably inevitable. The bank's mortgages had contained a power of sale after 30 days default and, when a offer to purchase was made by a consortium of local businessmen, the bank obtained a Court order confirming this action on 12 January 1903. The consortium of purchasers was headed by Albert Ball 64, later to become Sir Albert Ball, the father of Albert Ball V.C. D.S.O, M.C. who became famous as an air ace, and was killed, during the Great War. Ball senior (1863-1946) was originally a plumber in Lenton, Notts who, by the early 20th century, had become very well established as an estate agent who speculated in distressed or outdated stately homes 65 and other similar property throughout the area and, in this role, he was well placed to put together a syndicate to purchase the Watson property. His offer of £15,200 66 included all the property shown on the plan, including the mill and house, and also some currently unidentified property in Castle Donington. As well as himself (who took a 9/24 share), the syndicate included Arthur William Black (the local lace manufacturer) who took a 8/24 share, Frederick Ball (Albert's brother, a Nottingham architect) who also took a 8/24 share, William Thomas Norris (a Lenton builder) who took a 2/24 share and James Holroyd (a Nottingham estate agent) who also took a 1/24 share. The transaction took place on 9 May 1903 and the proceeds were distributed amongst the mortgagees. Wadsworth and Sidebotham, the first mortgagees, received the total amount then due to them (£7,262 19s 9d), Wadsworth also received £4156 0s 7d due to him against the mortgage of November 1900 67. This left £3,780 19s 8d which was paid to Capital & Counties Bank against a total indebtedness of £7,744 12s 7d. Although it was agreed that the property was sold free of any residual amounts owing against the mortgages, the shortfall of nearly £4,000 would still have been Watson's personal responsibility. Although it is possible that he was able to repay this amount from other resources, it would undoubtedly have left him in impoverished circumstances. He retired, probably with some financial help from friends, to lodge in two rooms at 88 Imperial Road, Beeston 68. He died, aged 84, on 28 January 1913 leaving a modest estate of about £123 69. But what was tragedy for Watson and his silk mill was a timely boost for Beeston's shopping street when the area was quickly redeveloped. The story of this phase is told as part of our High Road story.